The Body of Christ: What is 'Death'? This is an event that every single person who ever existed and will exist, has or will experience. Everyone experiences friends or family pass away; eventually even themselves. But what is it, and what happens to our consciousness and our bodies when we die? More importantly, what will happen after we are dead? This article attempts to navigate through the issue of our bodily death, our consciousness outside of our bodies, and understand what God has promised us in death. Generally speaking, this is the event where a person ceases to exist in the natural world. Spiritual death is the reality of separation from God. We can be alive in the natural world but spiritually dead in our relationship with God. Our parents, through natural biological mechanisms created by God, bring us to life in the natural world; but only God can bring us into Spiritual life in eternity. Thus death is the separation from life in the natural world and or separation from God. But looking at it in a deeper sense with the reality that some times people who were declared dead, have woken up days later we can see a deeper sense of death by separating a clinical death from the absolute death. There is something that God has connected our consciousness with our body. It is supernatural in its essence. This bond of the flesh and consciousness is described as the silver cord that connects the body and soul. It is this bond that is severed at our absolute bodily death (Eccl. 12:5-7). We may be able to change our bodily appearance but we are still who we are in our consciousness and soul. This is where all human resources and natural abilities to revive someone are unsuccessful and the individual is determined, from the worldly perspective, to be bodily dead. At this point, only a supernatural occurrence can revive them. If there is no supernatural intervention, than the bond is broken and they are absolutely dead and separated from the natural world. A grandmother in Russia was declared dead on Friday. On Monday the doctors were about to preform an autopsy when she woke up. The Chief Doctor stated "Proper checks are always conducted. This all happens before the family are informed about the death... The checks were carried out and she was dead - or so it seemed...'The papers could not have been signed unless this is what the doctors establish. We are still trying to understand what went wrong in Lyudmila's case'".. A 95 year old woman in China was dead for six days before she crawled out of her coffin and cooked herself a meal because she felt hungry after sleeping for a long time . These examples show that we can not fully understand death from just a earthly standpoint and the clinical death is not always an absolute death. Maybe what revived these grandmothers was supernatural or natural; regardless, it was not absolute and they still retained their supernatural bond to their corrupted bodies. Absolute death is just that, it is absolute. When no natural or supernatural interventions revived the body and the bond is severed. This absolute death is described in scripture as sleeping until the absolute resurrection takes place when God ends time (1 Thessalonians 4:13; 1 Corinthians 15:18; Mark 5:39; Daniel 12:2; John 11:11). At the end of time and judgement, the resurrection of those who are saved are given their new glorified bodies and those who are not saved remain consciously separated from God. The body is asleep but the soul is conscious. Soul Sleep is the idea that the soul is also asleep and not conscious with the body. This is not supported by scripture. If you notice that all those who are dead asleep in scripture, the reference to what is asleep is the body and not the spirit. Moses and Elijah were not asleep when they appeared with Jesus (Luke 9:30-31). Jesus tells the robber on the cross that he would be with Jesus in paradise, that day (Luke 23:43). That means that our body, in space and time is put to sleep in death; but the instant we absolutely die, we are taken out of space and time and consciously awake. The moment the robber absolutely died, he was consciously awake in spirit with Jesus Christ outside of space and time. If that isn't explicit enough, John himself saw the souls of those who were dead communicating with Christ (Revelation 6:9-11). Thus, the body is put to sleep at our absolute death but we are still conscious after our bodily death. 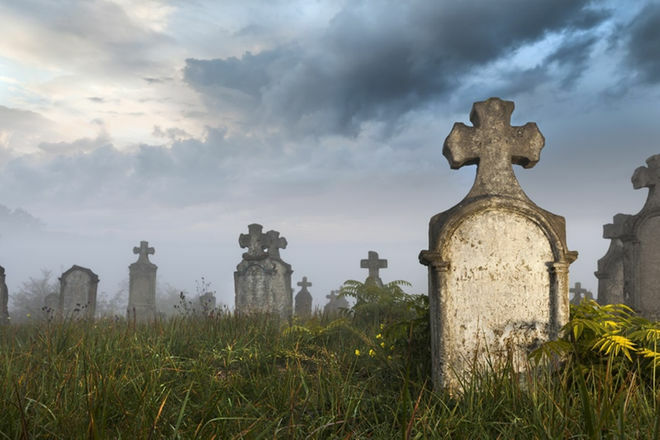 How are our bodies are 'asleep' while we are conscious with God, if they decay in the grave and turn to dust? Keep in mind, God knows every hair on your head. And though your atoms and molecules that make up your hair and body are now part of the earth; God can and will raise your sleeping body, atom by atom, molecule by molecule, just as He promised. How do you think he created Adam? From the dirt, atom by atom, molecule by molecule. But for us, it wont be just resurrected atom by atom but transformed into something greater; our eternal glorified bodies (Matthew 22:30-31; Luke 14:14; 1 Corinthians 15:52; 1 Thessalonians 4:16; Philippians 3:20-21). Where there will be no need for a new "silver cord" connecting our bodies and souls because our new transformed bodies will be eternal in and of itself and will never die. Holy Scripture records people who were determined to be dead but then came back to life (1 Kings 17:17–24; 2 Kings 4:18–37; 13:20–21; Luke 7:11–17; 8:52–56; John 11; Matthew 27:50–53). Did they experience the severed cord and absolute death? No. Holy Scripture states that Jesus was the first born of the dead (Rom. 8:29; Col. 1:18; Rev. 1:5). How is he the first born of the dead when people before him died and were raised? To understand this we must see the differences in Jesus' death and Resurrection and the ones before him. The Bond: Holy Scripture no where states anyone who died, gave up their spirit. Luke 8:55 states that "her spirit returned" to the same body it was supernaturally connected to. Where did it return from? If it went to eternity, it would remain there, that is eternity. Since it was outside of time and then returned to a space and time, it is like falling asleep and then suddenly waking up in the same instant. When Jesus died, Holy Scripture explicitly states He gave up his spirit of which did not return to the same body (Matthew 27:5). After his Resurrection, he manifested himself in his eternal glorified supernatural state; in the world, in time, while existing outside of time and not limited by it (1 Corinthians 15:6). Those who were revived, remained connected to their corrupted bodies in space and time. The Resurrected Christ did not return to his corrupted body but manifested himself in his glorified body in space and time while existing outside of it. The Body: Upon Jesus' resurrection, he was in a supernatural bodily state. All those were revived remained in the same body. Revived: It is even recorded in scripture they were "revived". The word used in 1 Kings 17:17–24 and 2 Kings 13:21; חָיָה 'chayah' means "to quicken, revive, refresh". Thus before they were to absolutely die, a supernatural event took place that revived them that kept them connected to their corrupted earthly bodies. Still Die: Those who were revived, clearly still had to absolutely die because they are not physically with us today and have become part of the earth. Jesus died once (Romans 6:10). Jesus faced absolute death and was Resurrected in a glorified state. Those who were revived, still had to face their absolute death. Eternity: Those who absolutely die, go to their eternal state of being (Ecc 12:5). Their bodies decay as their spirit goes consciously to God in eternity (Ecc 12:7). This is not a temporary event because the silver cord that held together the body and soul is severed. Given all this we can see in Jesus' Resurrection and the absolute resurrection promised to us; it is not the same as those who were revived from clinical death through natural or supernatural means. Though a supernatural intervention, after we may be pronounced dead, can revive us; we all will still face absolute bodily death before our absolute perfected Resurrection in eternity. This does not lessen the power and awesomeness of those who were revived in scripture. They were clinically dead and there was nothing left to keep them in this world. There was no medicine, medical procedure, no Defibrillator, CPR, or any known or unknown natural means that could keep them from dying. Without a supernatural intervention, their absolute death was inevitable. In God's supreme will and power, he decided when to take action and revive the clinically dead; because only he could. God is deserving of all the glory in reviving them just as much so as raising Jesus from absolute death. Because of what Jesus accomplished through His life, death, and resurrection; we do not have to fear death. It may be painful and slow but in the end and in light of the glory of eternity, it is nothing (1 Corinthians 15:55-57). Death has been transformed into a perfecting event in the Christian's eternal life. It is something to almost look forward to (Romans 8:18). Where we are made absolutely free from our corrupted flesh, conscious with Christ, and Resurrected in a glorified body (Philippians 1:21–23). One limited by time and space corrupted by sin; the other not bound by time and space and perfected for eternity in Gods Glory through Christ's righteousness (1 Corinthians 15:53). When we are declared dead and there is nothing natural that can be done, a supernatural event can still revive us in space and time. Once we are absolutely dead and our connection to our earthly body is severed; our body sleeps while we are conscious with God. At our absolute Resurrection we are given our transformed glorified uncorrupted bodies in eternity. There are still a lot of things about the Afterlife Scripture is not explicit on. Fully understanding where souls go before being revived is hard for us to grasp in our limited understanding of space and time. Same for understanding where the soul is for those who have died and before God has ended time. It is hard for us to get past thinking of the soul as something that occupies material space in time. This goes to the heart of "where" if anywhere souls exist. This is one of those issues that are of secondary and 'disputable matters'. What is not secondary is the fact that everyone will experience absolute death, the contradictory teaching of soul sleep, and the promise of the coming resurrection and glorified bodies with God in eternity for all those who believe.